Dough: Sieve the flour and salt together. Make a well in the center, pour oil in it and mix gradually. When the oil is fully mixed with the flour, add water (approximately 6 table spoons) and knead gently to make a semi-hard dough. Cover with a moist cloth and keep aside for 5 minutes. Divide into six equal portions and make balls. Filling: Heat ghee in a wok. add cumin seeds and satue over a medium flame until they begin to pop. Add singer, potatoes, chili powder and salt and fry for 5 minute. Cover and cook on a slow flame, stirring occasionally, until the potatoes are tender but not mashed. Now add the boiled peas and green chilies. Fry until the mixture is completely dry. Sprinkle pomegranate seed powder and chopped coriander. Remove, cool and divide into 12 equal portions. To make the Samosas: Place flour balls on a lightly floured surface and flatten each with a rolling pin into a disc approximately 8 inch diameter. Cut into half. Place on each half disc, flat on your palm with the straight edge along the forefinger. Dip other forefinger in water , line the edges and make a cone. Stuff a portion of the filling in it and seal the open end by pressing firmly. 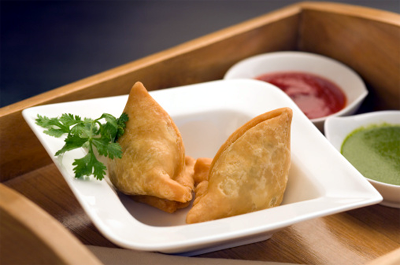 Sprinkle flour on a tray, arrange the stuffed samosas on it and keep aside until ready to fry. Heat oil in a kadai (deep bottomed wok) and deep fry the samosas over medium heat until golden brown and crisp serve with mint and tamarind chutneys.